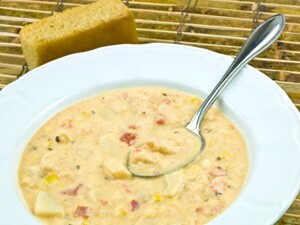 Our favorite Chicken Corn Chowder Recipe, try this zesty, easy-to-make, crock pot corn chowder recipe on a cold night. This southwestern dish provides variety and you can make it spicy or mild depending on how much chili powder you add. For spicy try using Ancho Chili powder. (Available at Whole Foods) For milder, try New Mexican Chili powder and/or omit the chili powder altogether. This flexible dish is great with and without the chili powder. Serve with a freshly tossed green salad and some garlic bread for a great summer dinner. Or pair with your favorite green veggie on a cold winter evening. If you want a more potent flavor; use yellow or red onions, in place of the scallions. If you are serving people with varying tolerance for spiciness: Consider adding the chili powder to the individual servings. For a thicker result: add more dehydrated potato flakes, until desired thickness is achieved, until desired thickness is achieved. For Gluten Free: This chicken and corn chowder recipe is already gluten free! Use all USDA organic ingredients: Corn in particular is almost always genetically modified if it isn't labeled organic. See more Healthy Crock Pot Recipes that can make meal preparation easy at the same time you provide your family nutritious food. Read about the Importance of a Healthy Diet, especially for babies, children and nursing moms. Read more about Traditional, Nutrient Dense and Organic Diets as well as the importance of consuming unrefined food. Read about Fun Activities to do with your kids. Visit our Natural Parenting Forum to read stories and ask questions of the community.